Timbers heading for a work-stoppage? Excited about the return of the Portland Timbers? Well, temper that enthusiasm because it appears more and more likely that the MLS is headed toward a work stoppage with the key sticking point free agency for players. Under the current system, a player who is released by a team or whose contract runs out must enter the MLS re-entry draft and then be allocated to the highest team in the pecking order who wants him. The players want unrestricted free-agency – they want players in that position to be able to sign with the team of their choice. The players are right. Unrestricted free agency would improve the level of play in the MLS by allocating the best talent to the teams who will make the best use of it. The draft system, while a decent way to ensure a level of parity is not efficient. Teams and player are often not matched optimally. For example, a team who has the first option on, say, a wing player who might already have a couple of decent wingers might just pick up the option to provide cover or to prevent the player from helping out a rival. On the other hand, a team in desperate need of a winger is prevented from signing that player. But the beauty of markets is their efficient allocation of resources. In an open bidding process, the team that expect to make the best use of the player will bid the most of the player thus ensuring the team with the highest valuation of the player gets him. Players will be more likely matched to teams that fit their skills and teams will improve. There are two counter arguments that I can think of. First, a team might have a high valuation on a player because they are simply weather. This is true in the Designated Player market but the re-entry draft does not affect that. Salary caps or, much better, NFL style revenue sharing (or both) are the way to deal with income inequality seeping into player. 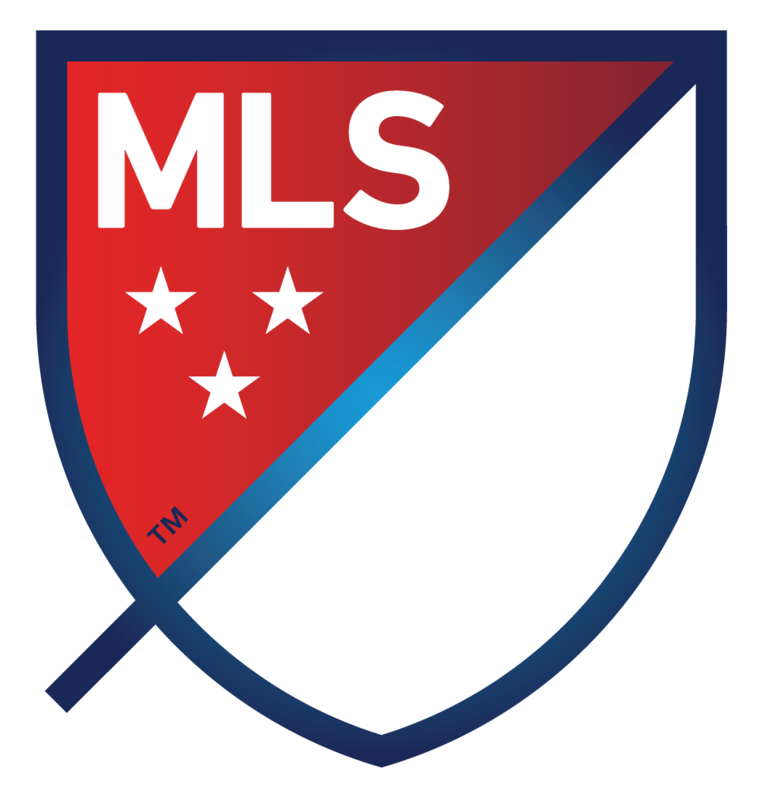 MLS has salary caps. Problem solved. Second, in the re-entry draft process teams can use the mythic ‘allocation money’ to trade picks and move up to get a player that want. But the ability of teams to do so is limited and this method is inefficient and likely leads to many instances where the efficient outcome was not reached. So I hope the MLS comes to its senses and grants free agency to players because the on-field product will be improved by so doing. The Portland City Council is considering new proposals to enforce short-term rental regulations. It is critical that Commissioners take the time to carefully weigh and address legitimate individual privacy interests involved with the City’s desire to expand its enforcement authority. Over the past year, Portland leaders worked thoughtfully to develop an Ordinance to regulate short-term rentals in a way that strengthens the region’s innovation industries and creates opportunities for economic growth. Without giving this new Code time to work, the City Council is already considering amendments that would undermine the original Ordinance and raise serious concerns about internet privacy. One proposal, offered by Commissioner Fish, requires any website where short term rentals are merely advertised to hand over user data at the request of the Revenue Bureau, without a subpoena or legal due process. This data includes physical addresses of hosts within Portland, including any and all related contact information of individuals associated with or acting as hosts. Delays at West Coast ports, including Northwest ports, have reached a critical point and threaten regional economies, according to recent news reports. The Pacific Maritime Association (PMA), which represents 29 West Coast port employers, has been locked in contract negotiations with the International Longshore & Warehouse Union (ILWU) since July of last year. That’s when the six-year contract between PMA and ILWU expired. Since then, both sides have blamed the other for major port delays that have left ships stalled at docks in Los Angeles, San Francisco, Portland and Seattle, among others. The ILWU says port operators aren’t providing sufficient resources or that their equipment isn’t safe, which is causing delays. Port operators counter, and recent judicial rulings seem to affirm, that the ILWU is engaging in deliberate delay tactics to gain leverage during ongoing contract negotiations. The U.S. Chamber of Commerce, along with the Coalition for a Democratic Workplace, National Association of Manufacturers, National Retail Federation, and Society for Human Resource Management, filed a lawsuit in the U.S. District Court for the District of Columbia to stop the National Labor Relations Board (NLRB) from moving forward with its “ambush elections” rule. The rule significantly shortens the period between the time the union files a request for an election with the Board and the time the election is to be held. The latest numbers released from one of the most trusted economic barometers in the nation showed the most positive gains since 2006, but the Oregon state director for the association that publishes the monthly report was thankful Oregon was only a part of the sampling not the big part of it. As it does every month, the National Federation of Independent Business, America’s Voice of Small Business, released its Index of Small Business Optimism, which measures the pulse of the nation’s largest employer group—Main Street entrepreneurs. The NFIB Research Foundation has collected Small Business Economic Trends data since 1974, originally publishing them quarterly and then monthly, since 1986. Survey respondents are drawn from NFIB’s membership. The report is released on the second Tuesday of each month. For 41 years, NFIB’s Index of Small Business Optimism has been one of the nation’s bellwether economic barometers, used by the Federal Reserve, congressional leaders, presidential administrations, and state legislators and governors. NFIB has 350,000 dues-paying members across the nation, including 7,500 in Oregon. On Wednesday, January 7, the Environmental Quality Commission (EQC) adopted rules necessary to implement the Low Carbon Fuel Standard (also known as the clean fuels program). By a 4-1 vote, the EQC approved rules to require importers of transportation fuels to reduce the average carbon intensity of fuels they provide in Oregon in order to meet annual clean fuel standards. The goal of the rule is to gradually reduce transportation fuel’s carbon content by 10% over 10 years. To meet the standards, regulated parties would need to blend diesel and gasoline with lower-carbon fuels such as: biofuels, natural gas, biogas, propane or electricity into its fuel mix; and eventually need to purchase clean fuel “credits.” In essence, the program begins as a fuel blending mandate and graduates to a carbon credit purchasing program. Like any individual economic measure, the unemployment rate is flawed. It can go down for bad reasons (people give up looking for work) and up for good reasons (more people looking for a job.) That’s why it is important to not just look at the unemployment rate itself, but the underlying components as well. As Danielle Kurtzleben notes over at Vox, the metros across the county with the largest unemployment rate declines are also losing labor force as well. Even if the number of jobs in the local economy remains flat, but more unemployed people drop out of the labor force, the unemployment rate goes down even though many would argue — myself included — that is not a signal that the economy improved. 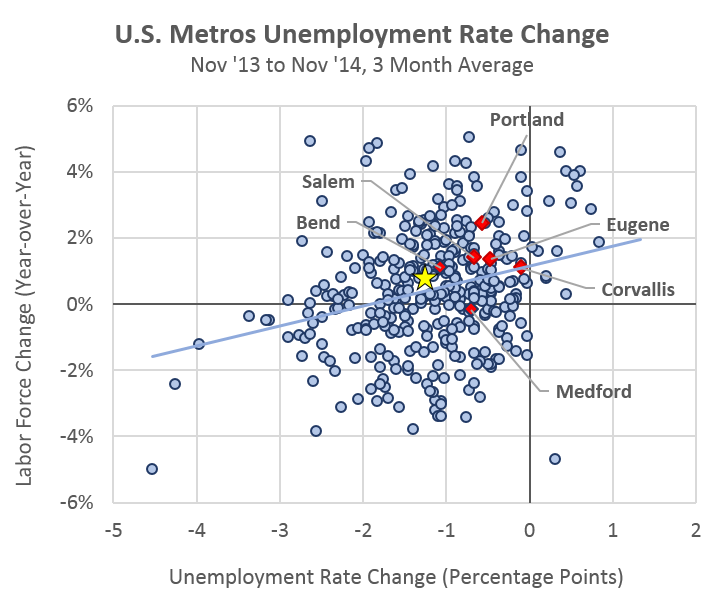 To get a better gauge of how pervasive these patterns are across the country, and here in Oregon, I plotted the latest data across all U.S. metros. The horizontal axis shows the unemployment rate decline over the past year, while the vertical axis shows the labor force change. There is quite a wide range of labor force behaviors for any given unemployment rate change, as seen in the graph. The Oregon’s Secretary of State Department’s website was breached by international hackers. The attack, which likely originated in China or North Korea, raised serious questions about the safety of personal information in the hands of state government. Oregon, like other states, is increasingly vulnerable to data breaches. According to recent report from the National Association of State Chief Information Officers, cyberattacks targeting state government are growing in number and sophistication. Attacks occur daily but they are not necessarily the same thing as a breach. When breaches do occur they cost states millions of dollars to fix, often affect millions of residents, and undermine public confidence in the ability of government to protect citizens against cybercriminals. State governments are perfect targets for information-hungry cybercriminals. Their sites contain a trove of valuable information on residents and businesses, holding comprehensive repositories of personal data, including tax returns (an all related personal information), and even health records. The report underscores the growing challenge faced by state governments to protect their databases from hackers, and sheds light on the magnitude of the problem. The “Top Ten Most Ridiculous Lawsuits of 2014” included the year’s ten most popular stories featured in monthly polls on FacesOfLawsuitAbuse.org. The “Faces of Lawsuit Abuse” campaign is ILR’s public awareness effort, created to highlight absurd and ridiculous lawsuits filed against businesses, families, and communities across the U.S.